Well known for its magnificent architecture and rich culture and history, Prague may have made it on your European travel bucket list. And what better way to experience the city than to indulge in its famous traditional culinary creations? We’ve got you some help with just that. Discover what to eat in Prague with these 15 traditional Czech foods. 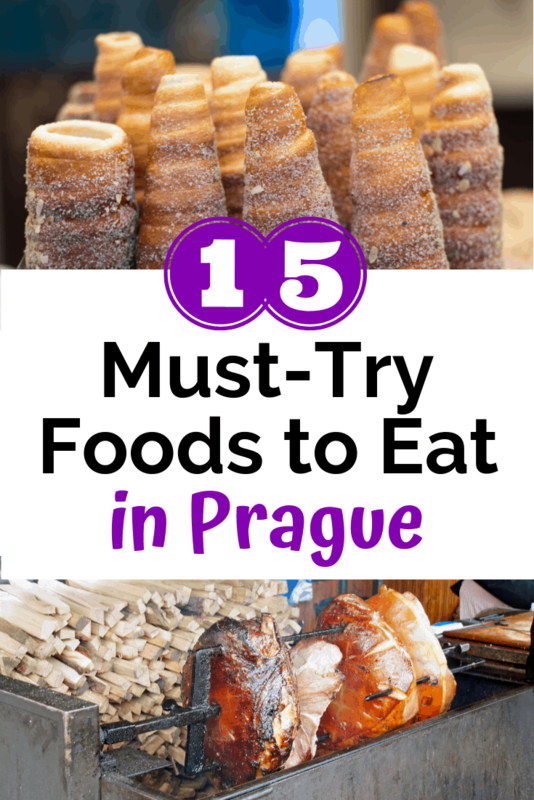 What to Eat in Prague: 15 Foods to Try! If there was a “tourist trap” of food, this would be it – but it’s delicious! 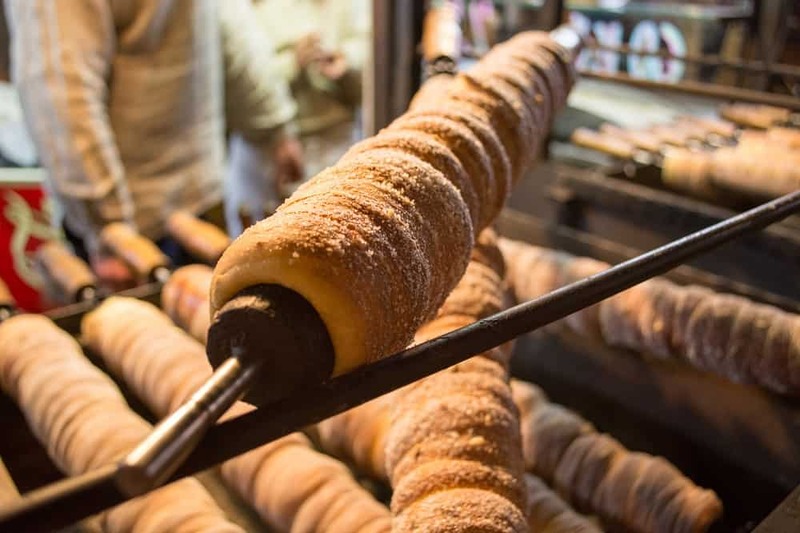 It’s not truly authentic Czech cuisine, as it originated in the Hungarian speaking part of Transylvania, and many locals will say that trdelník is simply made for tourists. But you can find it far and wide throughout Prague. Essentially, it’s a it’s a big ‘ol piece of pastry dough rolled around a stick and then roasted over an open flame. The result is a cone that’s a bit crisp on the outside and soft on the inside. You’ll find several sweet toppings on this one, but it is traditionally dusted with sugar, cinnamon and sometimes nuts. Meat lovers, rejoice! Guláš (pronounced goulash) is traditionally stewed beef served in a rich gravy, alongside bread dumplings. It makes for a super filling and delicious comfort food option. This is another dish that originated in elsewhere (Hungary) but has become ingrained in Czech cuisine. You can find it all over Prague, especially in local pubs. When I was visiting in the winter months, this was one of my favorite things to enjoy. And yes, you can also also devour these in different savory options if you’re up for it. The stuffings for those include meat, cheese and spinach, and you’ll find those in several cafes and restaurants across the city. As you can tell from this list, I have a fondness for pastries and desserts. Strudl became popular throughout many areas of Central Europe, Prague included. Unlike that which we find here in the US made with puff pastry, traditional Czech strudal uses a pastry dough that’s worked, rested, then rolled very thin. I’ve heard great things about the strudl over at Zizkovska strudlarna, a little bakery in Prague that’s off the beaten path. Super versatile and delicious, the Chlebícky is actually nothing but an open sandwich. It’s usually consumed for breakfast or lunch, and is often the go-to dish for get-togethers and parties. You’ll find these everywhere- from street stalls to elaborate restaurants, and while each place may have a different take on it, they are usually topped with salami, cucumber, ham, pickles and more. Craving for a satisfying and hearty meal but don’t have the time to sit down and dine? Grilované Klobásy is the perfect to-go dish to get your hands on. The sausages are grilled and cooked to perfection, placed in a roll. Depending on where you get ‘em, you may end up topping them with mustard or another add-on or sauce. They were a go-to for me when I wanted a cheap, quick meal in Prague, as they’re available widely from a ton of street vendors. OK, this one sounds a bit jarring when you know what the word means, but it’s really a unique event to attend in Prague. This isn’t just one food, but a whole event. Typically, these occur in the winter months between January and March. They’re generally held as a pre-Lent feast, with public hog fests taking place throughout the country. It’s certainly not for those who get weak in the knees seeing a dead animal, but if the sight doesn’t bother you, you’ll be treated with delicious head to toe pork products. The Knedlíky is a side dish in Czech cuisine, and is another delicious and flavorful food you definitely should try. They are basically boiled dumplings and are usually paired with a meaty dish such as the Guláš. They’re made with very simple ingredients – yeast, flour, egg, salt and milk – and then are just boiled and sliced. These bread dumplings help soak up the soups and stews. You’ll also find dessert versions of these, where the dumplings are filled with fruit or jam. Deep fried cheese, ya’ll. That’s right, Smažený Sýr is just a fancy version of a mozzarella stick. ? OK, OK, it’s a little different – it’s typically in a square, triangle, or ball, and uses different types of cheese. Typically it’s made with Edam cheese, which has a mild, slightly salty flavor. You’ll also find varieties made Hermelin cheese, a native Czech cheese that’s reminiscent of camembert, and less commonly niva, which is a blue cheese similar to Roquefort. This savory treat is a favorite among the Czech and tourists alike. It is usually served along with some fries, a fresh salad or bread rolls. If you’re strolling through the streets and get hit by a hunger pang, this one’s something you can’t go wrong with. Yep, another pastry to add to the list. Sometimes simply called kolach, this Czech pastry is a small round treat with a little bit of filling in the center. The outer part is similar to brioche dough, while the inner filling can be fruit-based or cheese-based. Most frequently you’ll find a tart jam like filing inside, sometimes sprinkled with poppy seeds or coconut. You’re probably familiar with these, as just about any continental breakfast at a hotel in America seems to have a cheaply made version of them, haha. Definitely try authentic ones in Prague if you get a chance! These breaded and fried mushrooms are often served as an appetizer in Prague, usually with a tartar sauce. They sound simple, but the combination of the fried coating with the umami-packed mushrooms, all dipped in tangy sauce – it’s delish. As an aside, mushrooms are a pretty integral part of Czech cuisine. (Going foraging for mushrooms has actually become a common outing!). If you’re not up for the fried version, try something like Houbový kuba (a risotto-style dish made with barley). Another one for the meat lovers. Sví?ková is a sirloin steak covered in cream sauce, traditionally served with bread dumplings. The meat is usually braised with vegetables, then finished with a sauce made from heavy cream (or sour cream) and some of the strained vegetables. 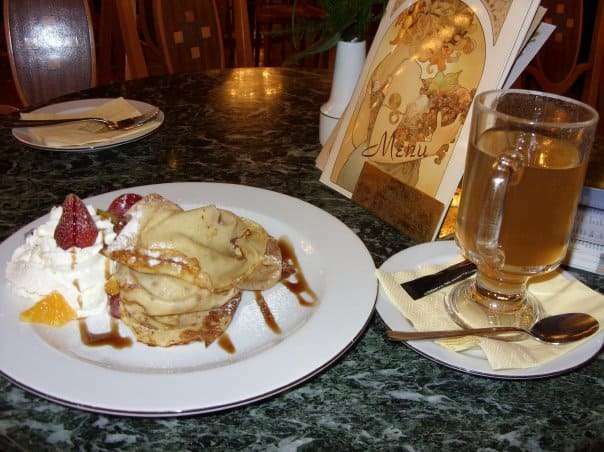 Originating in the historical Bohemia, Buchty are engrained in Czech cuisine. These small sweet rolls are typically made with a fruit filling. Usually, this is either apple, plums, or apricots which have been reduced down a bit and pureed to create a thick, concentrated sweetness. Want to try your hand at making them at home? This buchty recipe looks delectable. Utopenci is a pickled sausage. Apparently, this quite literally translates to “drowned men”, which just makes me giggle. Think of your typical meat sausages that have been soaked in a acidic marinade with several spices. These are traditionally eaten cold, and can be found at many pubs. A culinary exploration of Czech food would be incomplete without focusing on beer in Prague! Prague is most well-known for its Pilsner Urquell, but you can find a lot of other varieties as well. You’ll definitely want to check out Klasterni Pivovar, a restaurant and brewery situated nearby Prague Castle. I love that they offer seasonal varieties like “Easter” and “Christmas” beer. U Fleku is another must-see if you’re into beer; it’s the only brewery in Central Europe that’s been brewing beers for more than 500 years. 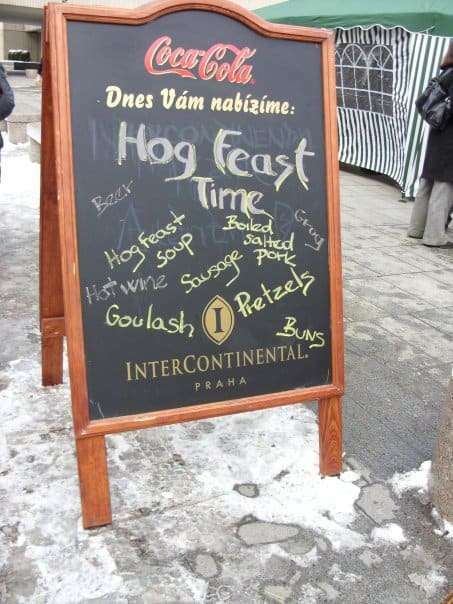 It’s not only a great place for a drink, but has a fantastic menu of traditional Czech food. 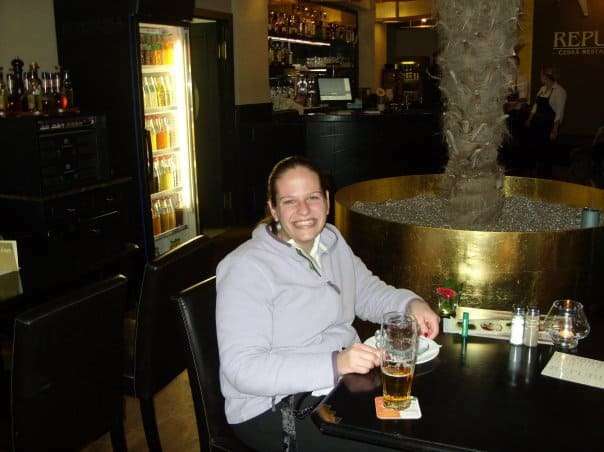 I hope this was a helpful overview of what to eat in Prague! There are probably several other amazing traditional foods that I left off, but these were a few of my favorites – or must-try options – when I was there. And besides the food, there is of course so much else to explore. It’s truly a wonderful place to visit! 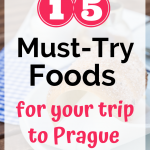 Share with me: When it comes to what to eat in Prague, which of these options sound most delicious to you? Did I miss any foods that are must-haves?